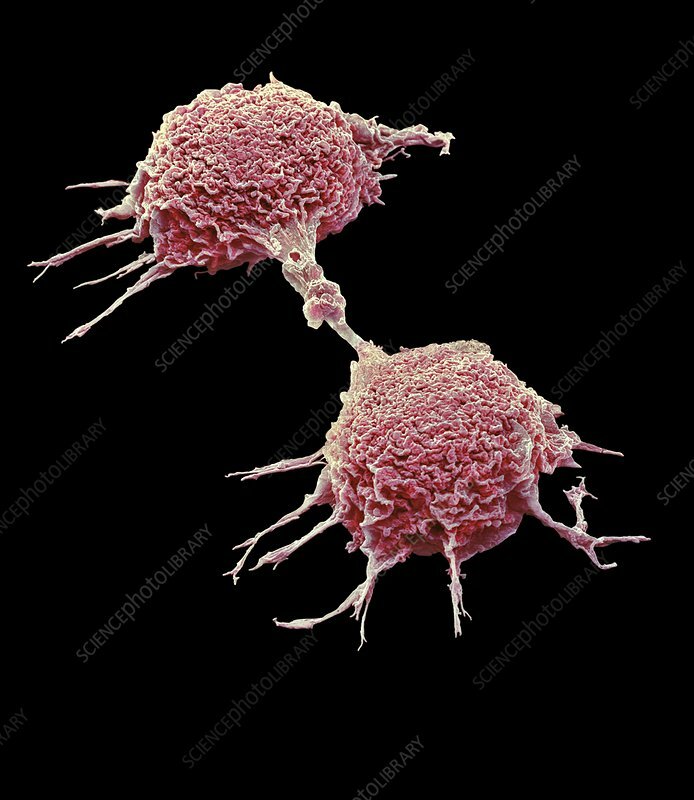 Lung cancer cell. Coloured scanning electron micrograph (SEM) of dividing lung cancer cells. Cancer cells divide rapidly in a chaotic, uncontrolled manner. They may clump to form tumours, which invade and destroy surrounding tissues. Lung cancer is a common form of cancer, frequently associated with smoking tobacco and exposure to industrial air pollutants. It causes a cough and chest pain and may spread to other areas of the body. Treatment includes surgical excision of the affected areas of the lung, with radiotherapy and chemotherapy. Magnification: x5000 when printed 10 centimetres wide.